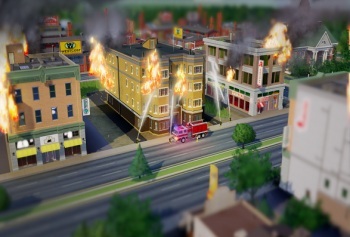 Maxis' Lucy Bradshaw describes SimCity reviews as "fair." Maxis' Lucy Bradshaw - the general manager in charge of the whole Sims shop - has gone on record, in a CVG interview, as saying that she accepts that SimCity's woes, due mainly to server accessibility, is "our fault." Bradshaw went on to say that SimCity's review scores, based to a large extent on its connectivity issues, were fair, and that she hoped the reviewers would revisit those scores now that connectivity wasn't a problem. "SimCity is an online game," says Bradshaw, "and everyone - fans and critics - have every right to expect the experience to be smooth from start to finish." Unexpectedly high player numbers on launch, combined with servers that didn't perform as well live as they did in testing, were the two main reasons why SimCity suffered such a catastrophic server problem. Bradshaw believes that new servers, and upgrades to the existing ones, have solved its issues. "Maxis performs at its best when it is challenged," said Bradshaw, "and this is the most challenging situation that any of us have ever faced." Challenging for Maxis, and for her team, which worked for years to make SimCity the best it could be, but which had to watch as the launch turned into a disaster. "I feel like I let them down, this was my responsibility," says Bradshaw, "but I tell them what we all know: SimCity is a wonderful game and that we should all be proud of the effort that went into making it." Her final words are to fans of SimCity. "We made this game for you because you asked us for another SimCity," she says. "It's our fault that we got a little too ambitious and I'm disappointed that the Live Service didn't live up to its end of the bargain." But things should be improving, she says; hopefully improving enough that Maxis can win those fans around.